I believe that people have maybe one or two passions. For some it is music, for others it is politics. But for me, it is film. I like to watch films and I like to read about film, but mostly I love to talk about film. And when someone has a true passion about something, they can debate for hours on end and in some circumstances, if not most, can become a little bit defensive. And this is exactly what happened when it came for me to discuss a film which is part of a franchise I consider to be my “Star Wars”. This is Ridley Scott’s newest entry, Alien: Covenant (2017). After long discussions with other viewers and a full week reflection on the film’s positives and negatives, I have decided the film is not as good as first thought. I must admit when I came out of the theatre I was almost blinded by nostalgia and let it affect my initial rating. But I maintain it does not deserve some of its poorer reviews either, and over the course of this review I hope to cover why. I went to the theatre with high expectations as this was the long anticipated sequel to Prometheus (2012); a film that I maintain is seriously underrated. Prometheus may have been riddled with plot holes but after a 5 year hiatus, Scott was finally going to treat his audience with some answers. At least this is what I thought. Instead I got a satisfying Sci-Fi Horror with several issues. Visually the film is exactly what you would expect from a Ridley Scott picture. Like its predecessor, there are stunning vista shots of newly discovered planets and effects are used expertly to immerse the viewer into the world that our unlucky crew have set foot upon. The film opens with the formation of David (Michael Fassbender). This short back story conveys the films theme of creation to the viewer and that David as an android, although a “slave” to Weyland (Guy Pearce) is actually superior as he can potentially live forever. This scene is reminiscent of the film’s predecessor and I feel is where tonally the film is at its best. We then cut to 2104 where a crew are transporting 2,000 colonists to a potential new home. The ship succumbs to neutrino bursts which kill some of the colonists and the Captain. During the repairing of the ship the crew picks up a transmission and Daniels (Katherine Waterston), who is Ripley’s counterpart, argues with newly promoted Captain Oram (Billy Crudup) about tracking down this transmission. She eventually loses and off they set. This all too familiar plot is rather bland by now but what affects this film more is instead the lack of characterisation. Like Prometheus there are far too many crew members and not enough time spent with them, so when a character does die I am not upset but instead angered by their stupidity. The crew’s saving grace, performance wise, is Walter (Michael Fassbender) a newer model android who’s more human like system leads to conflict between himself and older model David. The movies pace is strange with it swapping between a Prometheus like intro, to a Sci-Fi horror first act, before transitioning back to Prometheus sequel, to then capture both atmospheres in the final third. The film makes its best attempts at trying to keep fans of both Prometheus and Alien fans happy and I feel it does a good job. The film’s score as well as flashbacks and dialogue from David set themes of creation and discovery. Then the film goes full slasher with battles between aliens and crew. The Neomorph reveal is excellent and the scene amongst the crops is where this atmosphere truly shines. But later the horror elements fade with the lack of the unknown almost disappearing. From then on the viewer often knows where the creatures are and see everything they do. Therefore lessening the tension Scott masterfully captured in Alien. But these issues are nothing compared to my three biggest concerns of the movie, the first being the treatment of Shaw (Noomi Rapace). The audience learn that the transmission comes from Shaw a character from the previous movie. And if you are like me and knew she would make an appearance, her death told by David is both disappointing and saddening. A character of her calibre certainly deserved a better send off. Then there is David immediately killing the “engineers” which not only raises more questions but seemingly makes some of Prometheus seem quite pointless. And lastly the film’s cliché ending is just frustrating. However regardless of all of that I still enjoyed it. The visuals, some dialogue and strong performances of Fassbender, Waterston and even an unusual casting of Danny McBride still make this a very likeable movie, of which its genre, Sci-Fi Horror, is fairly scarce. The use of CGI for the Neo and Xenomorphs allow for much more versatility and has me excited for seeing their return in future sequels. The scene of both androids conversing seamlessly is a standout part. However for every good scene there is another bad one lurking very soon. 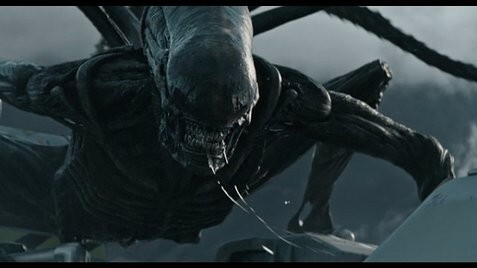 A frightening Neomorph back burst to an unneeded Xenomorph crane fight. Then a thought provoking interaction of thematic dialogue to a silly robot battle, but what truly holds this film back from being great is what it could have been. Personally I would have been happy for a more true continuation of Prometheus with the “engineers” Shaw and David at the forefront and leaving the horror elements for the next film. But instead it feels the studio and the director sadly had to bow down to audience pressure of wanting another “Alien” movie. I don’t know who I blame, I just know there are two more future sequels planned and I eagerly look forward to seeing what the franchise holds. Tagged alien: convenant, film review, jack perrett. Bookmark the permalink.